Dig! Don't give up, DIG! I guess We'll make this the game room. Now that's a sweet ride! It was a bit of work but it’s finally complete. Working off and on through the summer months I’ve installed our Fantech HP190sl outdoor system. Due to an unsual home layout there was no way for us to install a mitigation system without intruding on a living space on the floor above or placing piping in the middle of a living space in the basement. We opted for the outdoor system and soon found we had other problems as well. Because of our soil make up we’d selected 4” pipe, this made exiting the house exceptionally difficult. The distance between the floor joists and the rim joists on the side we’d selected would not allow a 4” 90 deg elbow or other couplers to fit. 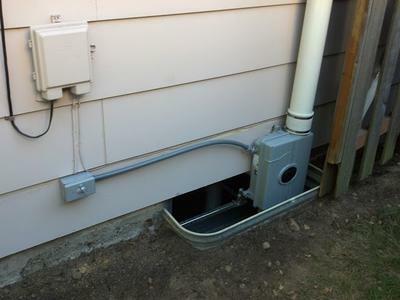 The problem we would run into mounting in another location is that we would have to dig about 6ft down in the dirt to the pipe exit on the other side of the house and we could have encountered sewer lines on that side. 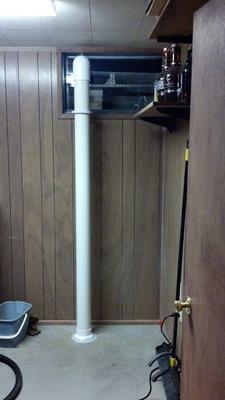 The solution I came up with was to run the pipe out a window replacing the glass with acrylic. I truly envisioned this looking much more hideous than it does now. Once we set to work it was a piece of cake; except for the massive rocks under the foundation. 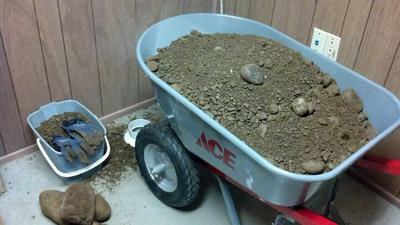 I pulled out 1 and a half wheelbarrows full of dirt until I just couldn’t reach any more. Doing this one handful at a time really provides you some quality time to think. Exiting the basement window I built a bracketing system to hold the lower body of the fan in place and the window well protects most of the fan from water splash in the rain. From there I ran about 15’ of pipe right up the side and out the roof of the house. The fan runs very strong yet is exceptionally quiet. Thanks for all of your help Val!